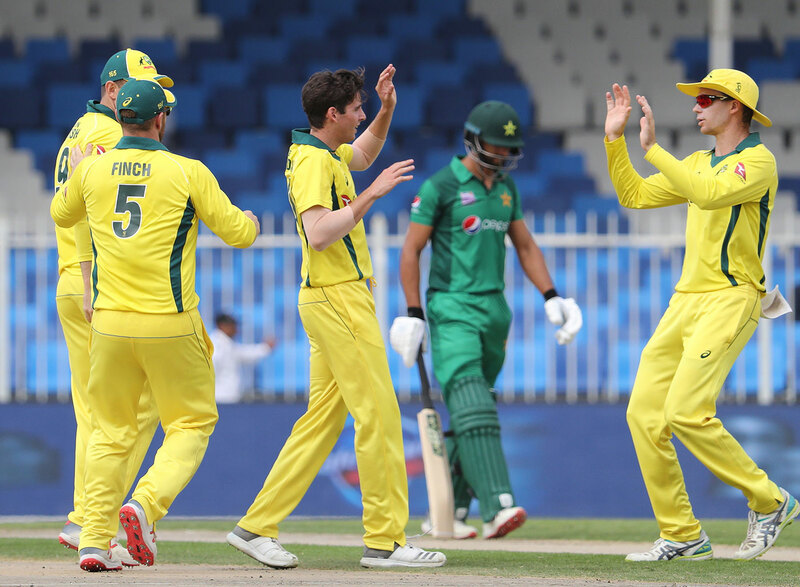 Jhye Richardson's World Cup hopes are in doubt after he was ruled out of the remainder of the Pakistan series having dislocating his right shoulder in the outfield during the second ODI in Sharjah. He suffered the injury on the fifth ball of the 11th over diving to his left in an attempt to save a boundary in the deep midwicket area. He landed heavily on his right elbow, and immediately gestured for help, with his right arm hanging limply by his side as he was helped off the field by the Australia medical staff. Shortly after leaving the field he was pictured in the dressing room wearing a sling and gave an encouraging thumbs up to the camera. "He's in good spirits," Finch said after the match. "His shoulder popped out a little bit. Unfortunate for the youngster. He'll get home, have some scans and assess the damage." Finch added that the shoulder was popped back in swiftly which raised hopes of Richardson making a quicker recovery, but it won't be until he gets back to Perth that the full extent of the damage will be known. World Cup squads need to be named by April 23 although changes can be made after that until mid-May with ICC approval. The added problem for Richardson is that the injury is to his bowling arm. "It's horrible to see. I hate when people dive and they come back up and you know something's wrong," Usman Khawaja said. "It makes your stomach sink He's a good kid. I'm sure he's going to come back much stronger...fingers crossed it's all good. I think it went back in pretty well, pretty easily, so that's always a good sign." Richardson had been the best Australian bowler in the early stages of the second ODI. He maintained a probing line for most of his five-over spell, removing both openers. Of late, he had become one of the leading fast bowlers in the side, taking eight wickets in the last three ODIs against India and making a compelling case for a regular place in the XI in the one-day setup. Richardson's injury left Australia with a bowler short with Finch pressing himself into service to fill the void. He was such a success with his left-arm spin that he bowled his full 10 overs which included the wicket of Haris Sohail. Pat Cummins, who has been rested for the first two ODIs, Kane Richardson and Jason Behrendorff are the other fast bowlers in the squad. Mitchell Starc (pectoral muscle) and Josh Hazlewood (back) have missed both this and the India series.